The UK's only female giant panda Tian Tian has been artificially inseminated at Edinburgh Zoo. Experts carried out the procedure on Sunday after her annual health check, the zoo said in a tweet. Tian Tian, which means Sweetie, has failed to produce a cub despite repeated artificial inseminations since her arrival at the zoo in 2011. The zoo and giant panda outdoor walkway are open, but the panda indoor viewing area will remain closed. Panda reproduction is notoriously difficult, partly due to the very short breeding window with ovulation occurring only once a year. Staff had hoped Tian Tian would mate naturally with the zoo's male giant panda Yang Guang but after years of failed attempts the breeding programme was suspended last year, with officials saying they wanted to make improvements to the pandas' enclosure before trying again. In November, it was reported that the zoo's male giant panda Yang Guang had both testicles removed after tumours were discovered by keepers. This year, a decision was taken to artificially inseminate her using sperm from a panda in the Chinese panda breeding programme. Some animal rights campaigners have in the past criticised the use of artificial insemination and attempts to breed the animals in captivity as there is no intention to return to them to the wild. The two giant pandas arrived in Scotland in December 2011 and are being rented by Edinburgh Zoo from the Chinese government for a decade for an annual fee of about £600,000. 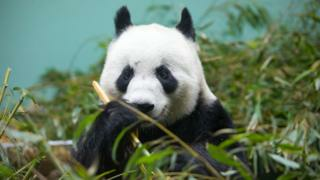 Tian Tian had previously given birth to twins in China but all attempts to produce a cub at Edinburgh Zoo have failed. Zoo staff believe she may have been pregnant on a number of occasions but pandas sometimes re-absorb the foetus during the course of the pregnancy. There was considerable diplomatic effort on the part of the Scottish and UK governments to bring the pandas to Edinburgh Zoo in 2011. The zoo argued that they had suitable staff and could call on outside experts who would work together on panda breeding and conservation. The zoo had a financial arrangement with the Chinese authorities to keep Yang Guang and Tian Tian for 10 years at an annual fee of £600,000. As part of the deal, any cubs would remain in Edinburgh for two years before being sent back to China. In the first year after the arrival of the pandas, the zoo enjoyed a 50% increase in its visitor numbers. A report from Scottish Enterprise estimated they would generate almost £28m for the Edinburgh economy during their 10-year stay, with an additional £19m being spent in the wider Scottish economy.